During an eye test, eye doctors use eye charts to measure how well you see in the distance, compared with other human beings. 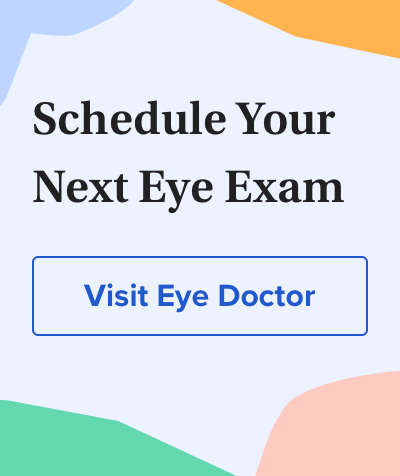 If you haven't established one yet, click here to find an eye doctor near you. The classic example of an eye chart is the Snellen eye chart, developed by Dutch eye doctor Hermann Snellen in the 1860s. There are many variations of the Snellen eye chart, but in general they show 11 rows of capital letters. The top row contains one letter (usually the "big E," but other letters can be used). The other rows contain letters that are progressively smaller. Download a Snellen eye chart and instructions for use here. In the United States, the standard placement of the eye chart is on a wall that's 20 feet away from your eyes. Since many eye doctors' offices don't have rooms that are 20 feet long, in a smaller room the eye chart may hang behind the patient chair, using mirrors to make it appear in front of you at a simulated distance of 20 feet. 20/20 vision is considered "normal" vision, meaning you can read at 20 feet a letter that most human beings should be able to read at 20 feet. Eye charts can be configured in various ways, but generally, if during an eye test you can read the big E at the top but none of the letters lower than that, your vision is considered 20/200. That means you can read at 20 feet a letter that people with "normal" vision can read at 200 feet. So at 20/200, your visual acuity is very poor. In the United States you are considered "legally blind" if your best-corrected visual acuity (meaning, your best distance vision with eyeglasses or contact lenses) is 20/200 or worse. To get a driver's license in most of the United States, your best-corrected visual acuity must be at least 20/40. Usually the 20/20 line of letters is fourth from the bottom, with 20/15, 20/10 and 20/5 below that. Not many people have 20/10 or better visual acuity, but many animals do, especially birds of prey, which have been estimated to have an acuity of 20/5 or even better. In some cases a standard Snellen eye chart cannot be used. One example is when the person having the eye test is a young child who doesn't know the alphabet or is too shy to read letters aloud. Other examples include when the person is illiterate or has a handicap that makes it impossible for him to cognitively recognize letters or read them aloud. In these situations, a modification of the Snellen eye chart called a "tumbling E" chart may be used. The tumbling E chart has the same scale as a standard Snellen eye chart, but all characters on the chart are a capital letter "E," in different spatial orientations (rotated in increments of 90 degrees). The eye doctor asks the person being tested to use either hand (with their fingers extended) to show which direction the "fingers" of the E are pointing: right, left, up or down. Studies have shown that visual acuity measurements using a tumbling E chart are virtually the same as those obtained from testing with a standard Snellen eye chart. Download a Tumbling E eye chart and instructions for use here. A Jaeger eye chart contains several blocks of successively smaller text, generally ranging in size from J10 (large print) to J1 (very small print). The original Jaeger eye chart was developed in 1867 and contained seven paragraphs, each printed in a successively smaller font size. The smallest paragraph you could read when holding the chart approximately 14 inches away determined your near visual acuity. Since then, there have been several modifications of the Jaeger chart (or "Jaeger card") by different manufacturers. Unfortunately, modern Jaeger charts are not standardized, and the actual letter sizes on different Jaeger cards might vary slightly. The type scale on a modern Jaeger eye chart usually ranges from J10 (approximately 14-point type for Times New Roman font) to J1 (approximately 3-point type, Times New Roman). Some Jaeger charts have an additional paragraph labeled "J1+" that may be even smaller than the J1 block of text. Download a Jaeger near visual acuity chart and instructions for use here. Eye charts measure visual acuity only. They do help your eye doctor figure out whether you need prescription eyeglasses or contact lenses for your distance vision. And they help the Department of Motor Vehicles to determine if you are required to use eyewear for driving, or if you shouldn't drive at all because you are legally blind. But eye charts don't measure your peripheral vision, depth perception, color perception or ability to perceive contrast. So eye chart testing is just one component of a complete eye exam, which you should have every one or two years. Schwiegerling, J. Field Guide to Visual and Ophthalmic Optics. SPIE Press. 2004. Can Jaeger numbers be standardized. ARVO Annual Meeting abstract. Investigative Ophthalmology & Visual Science. May 2007. Khurana, AK. Theory and Practice of Optics and Refraction. Elsevier India. 2008.